This 36 acre, 1.5 mile long valley along the Bear River in Petoskey is truly spectacular. Having just undergone a $2.4 million face lift, the Bear River Valley Recreation Area is filled with natural beauty and things to do. 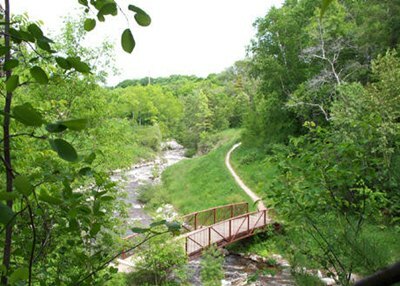 All located within the city of Petoskey, this expansive park features steep terrain, unpaved and paved trails, forests, and boardwalks. 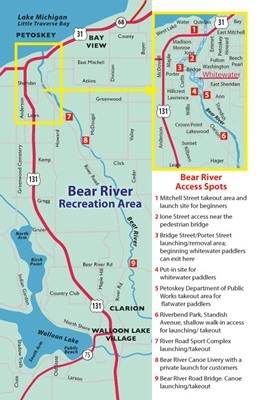 Activities include biking, hiking, walking, fishing, picnicking with two shelters, restrooms, events and performance areas, stairs down to the river, a footbridge across the river, nature watching, and whitewater kayaking in the Lower Peninsula's only whitewater park. It is a gem of park. This is a downtown park and is the envy of many downtown business districts. Just a two block walk from the Gaslight district, the Bear River Valley Recreation Area is a great place for lunch, a long walk along the river, or kayaking through a variety of river terrain. The Bear River Valley Recreation Area is not a landscaped and developed park area but is instead a natural area filled with spectacular steep bluffs, natural forests, grassy open spaces, and local plant species. Entrances to this park are located on West Lake Street, Sheridan Street and several adjacent neighborhoods. There is ample parking. Kayak and whitewater rafting concessions may be added in the future. Don't miss this new outdoor experience.